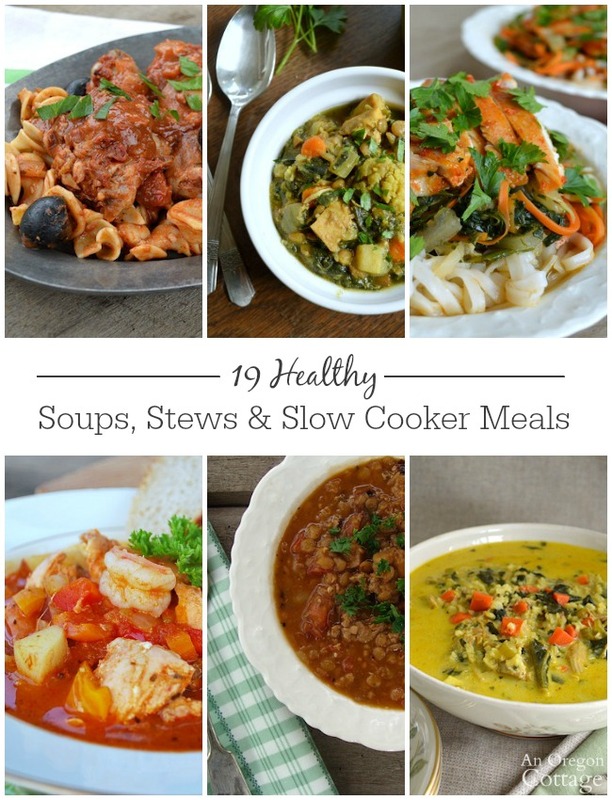 Flavorful, simple, and healthy soups, stews and slow cooker dishes for every night of the week that your whole family will love. Hello, friends! As part of our Healthy Eating series, I am sharing our family’s favorite healthy recipes from the blog archives – categories including main dishes, snacks & sweets, breads & breakfasts as well as today’s healthy soups, stews and slow cooker meals. Personally, I feel that soups and stews are just about the perfect meal for the cold, winter months when a bowl of warm, comforting food is so welcomed. And when a meal is made in a slow cooker, all ready to eat when you get home? Perfection. It’s part of what I enjoy about seasonal eating – I love the salads of summers just as much as the soups and comforting foods of winter. I have met people who do not feel the same as I do, though, and if you fall into that camp, I’d challenge you to try to embrace weekly soups just because they are usually so easy to make healthy! Sometimes I just can’t believe the amount of vegetables you can stuff in a soup – and not feel like you’re eating a lot of vegetables! And the variety – it’s so easy to add international flavors, spices, and more to make them so different from each other. 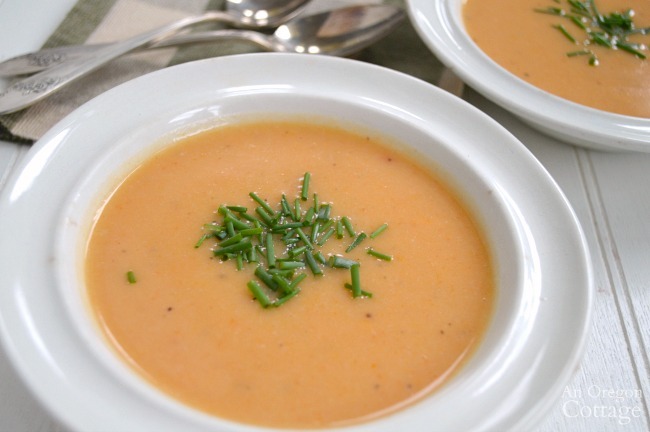 There, I’m off my ‘you should try soups’ soapbox – now go forth and make soup! 1. 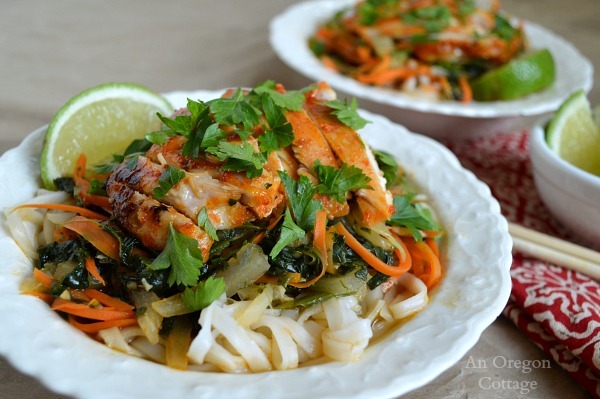 Sriracha Chicken Noodle Bowls. A whole meal in a super flavorful bowl – what’s not to love? Bonus is that it’s gluten free. 2. 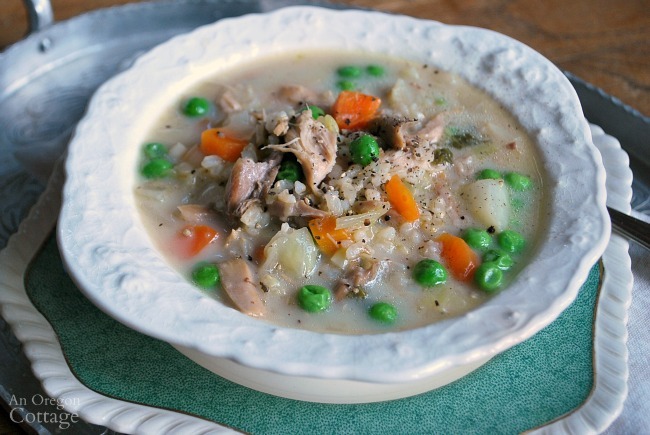 Creamy Turkey-Rice Soup I love using up the whole turkey so that none of it goes to waste. This changes up the traditional turkey noodle soup with rice and a creamy base. Oh, and this is perfect with a chicken, too! 3. 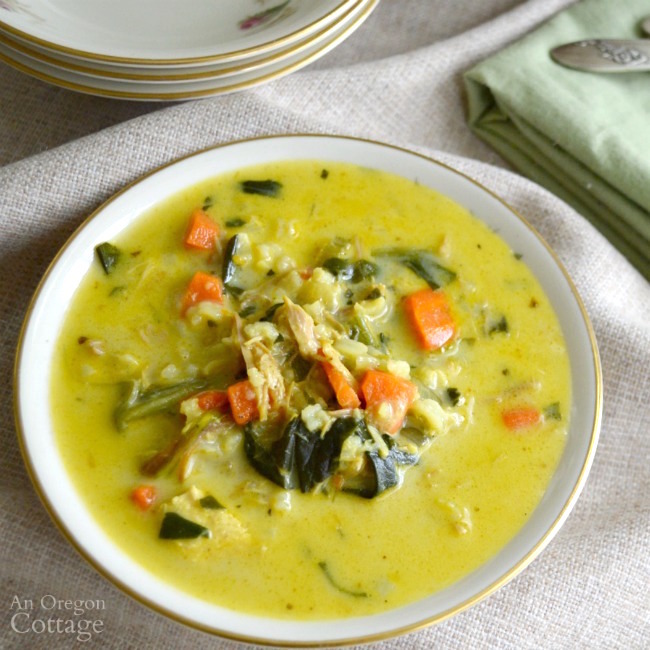 Curried Turkey or Chicken and Rice Soup. This uniquely flavored turkey soup has shot to the top of the list when I have turkey (or chicken) bones to use up. It is SO good you won’t believe it’s “just” turkey soup. 4. 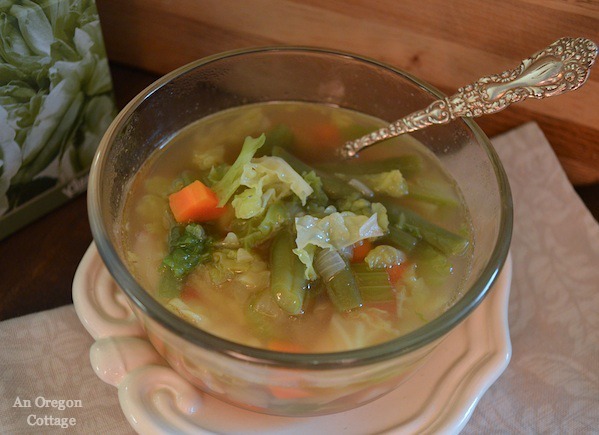 Quick & Healthy Bone Broth Chicken Vegetable Soup. Wonder how to make a healthy bone broth soup fast? Make bone broth in the slow cooker, keep it in the freezer and you can make a healthy vegetable soup whenever you need it – quick. 5. The BEST Sausage and Lentil Stew. This really is the best lentil soup I’ve every had. 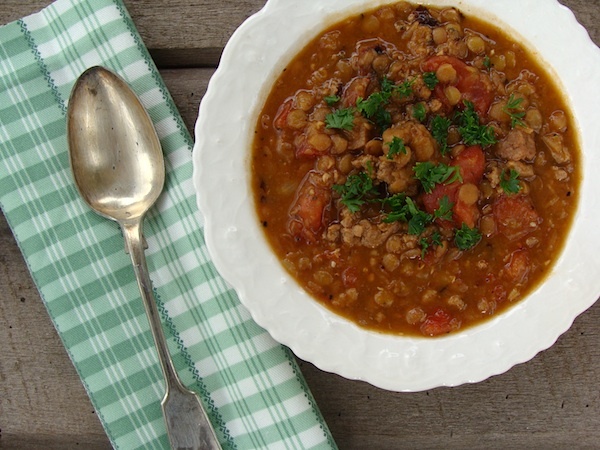 I literally crave it – when was the last time you could say that about lentil soup? 6. 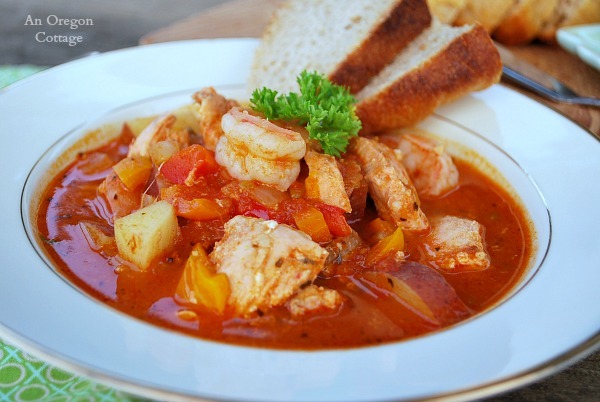 Savory Tomato Seafood Stew. This soup may remind you of a bouillabaisse, but without all the work (or expensive ingredients. All you need to add is some crusty bread for a lovely one-dish meal. 7. 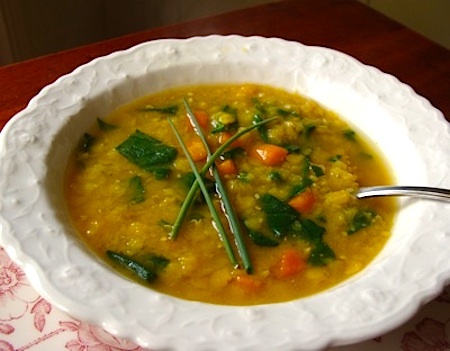 Fast & Easy Curried Red Lentil Soup. Red lentils cook fast, so this is your 15 minute soup – really. 8. 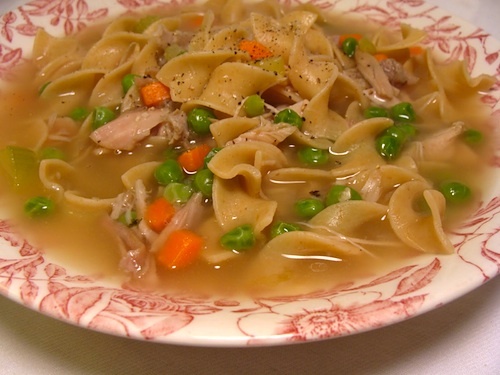 Traditional Turkey Noodle Soup. The classic way to make use of your holiday turkey. I look forward to this (or one of the turkey soups above) almost more than the turkey itself! And this works just the same for chicken, too. 9. The “you-won’t-believe-it’s” Cauliflower Cheese Soup This soup is chock full of cauliflower, onions, and carrots, in addition to the cheese, and my kids never knew they were eating all those veggies! 10. 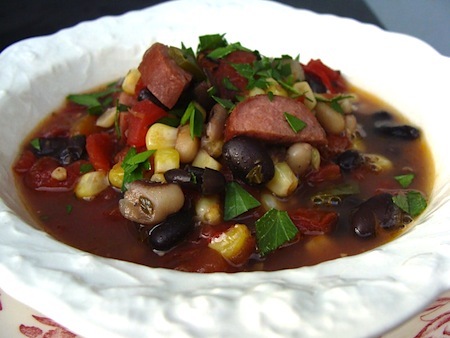 Easy Black Bean & Sausage Soup. Got smoked sausage and precooked beans and corn? Add canned tomatoes and you’ve got an easy weeknight soup. 11. 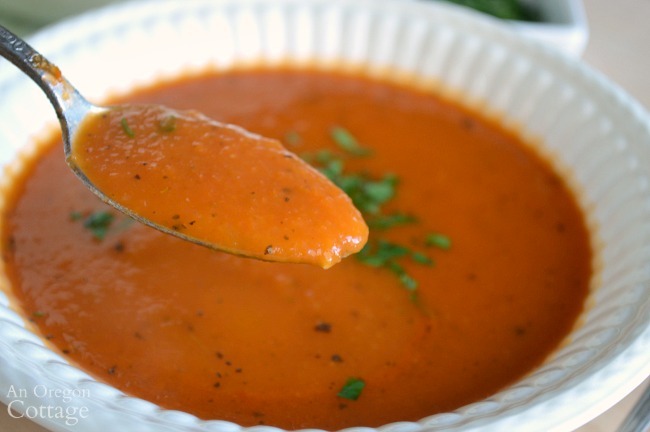 Homemade Tomato Soup– This soup is SO good and SO easy, you’ll seriously wonder why you ever bought the cans! 12. 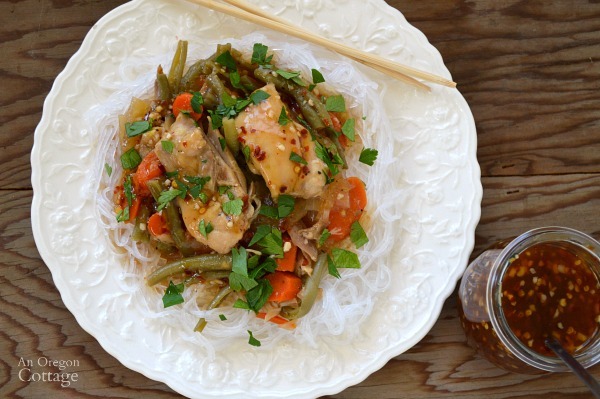 Slow Cooker Sweet Chili Chicken & Vegetables. I created this recipe to have a one-pot Asian inspired meal all ready to go in a slow cooker. It uses my honey-sweetened homemade sweet chili sauce recipe and it’s all very good. 13. Slow Cooker Chicken & Vegetable Lentil Curry. Comforting curries are my favorite way to get a lot of vegetables in one pot with a lot of flavor. The added health benefits of lentils (fiber!) make this a keeper. 14. 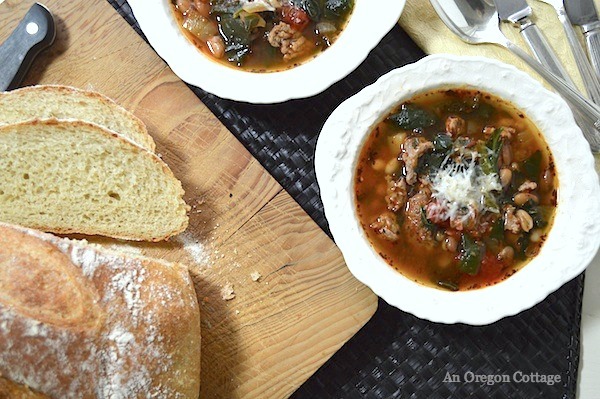 Slow Cooker Sausage Bean Soup with Spinach & Tomatoes. This soup hits all the right notes with it’s tomato base with sausage and beans. 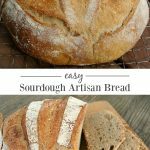 Add some good bread and you’re set. 15. 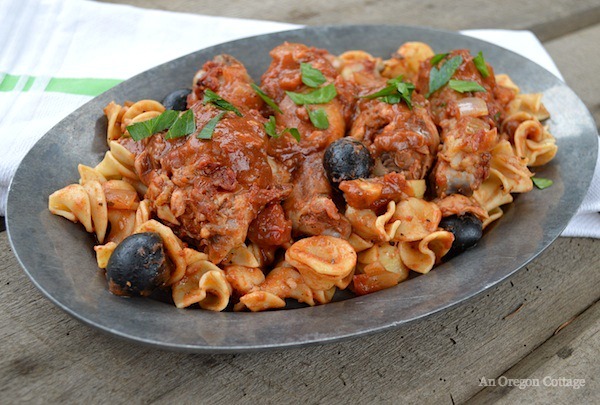 Slow Cooker Chicken with Artichokes, Dried Tomatoes & Olives. Oh gosh, the flavors of artichokes, onions, olives, and tomatoes meld so well with the chicken after a day of cooking. Dishes like this were what slow cookers were meant for! 16. Slow Cooker Chicken Chili. 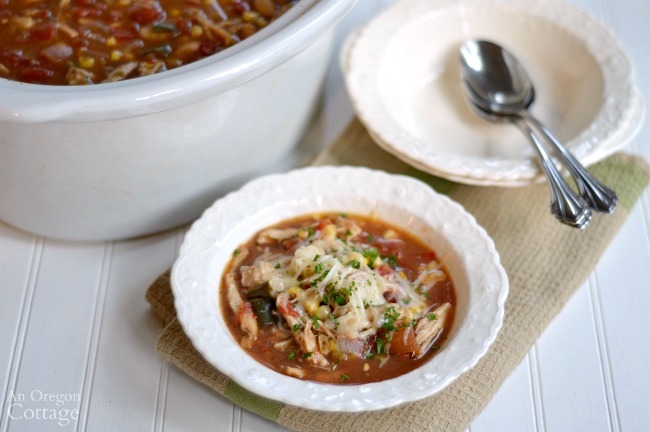 A chicken chili make healthier with a tomato base and full of vegetables. Served with tortilla chips or quesadillas, this is everyone’s favorite. 17. 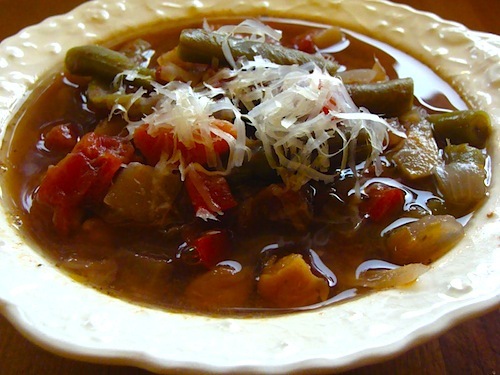 Slow Cooker Italian Vegetable Beef Soup. Vegetables and beef simmering in a broth seasoned with classic Italian herbs (and plenty of garlic!) 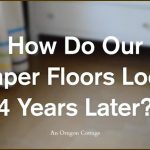 – it’s wonderful to come home to this! 18. 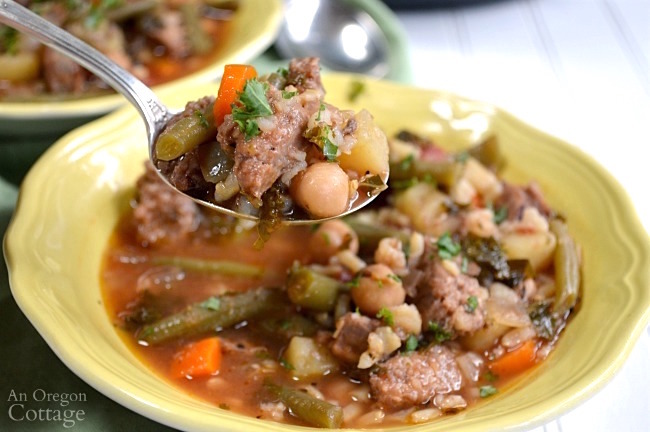 Slow Cooker Italian Sausage Vegetable Soup. This is one of my favorite slow cooker soups – it gets better everyday which makes it perfect for leftovers. 19. Easy Slow Cooker Cassoulet. 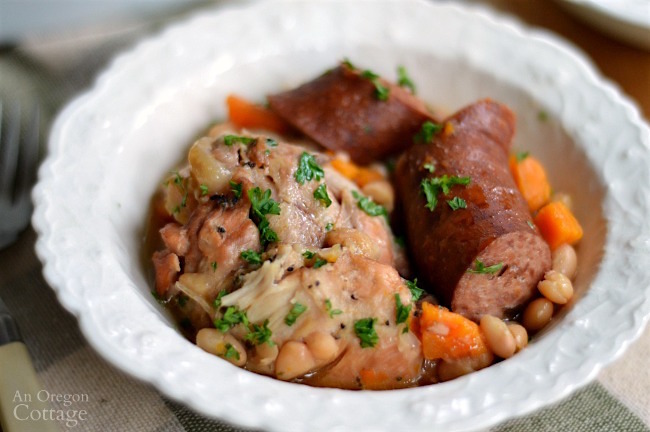 Get all the flavor of long-cooked cassoulet in an easy slow cooker recipe. The chicken is falling off the bone and the carrots are tender. Serve this with crusty bread for sure to sop up all the wonderful juices. 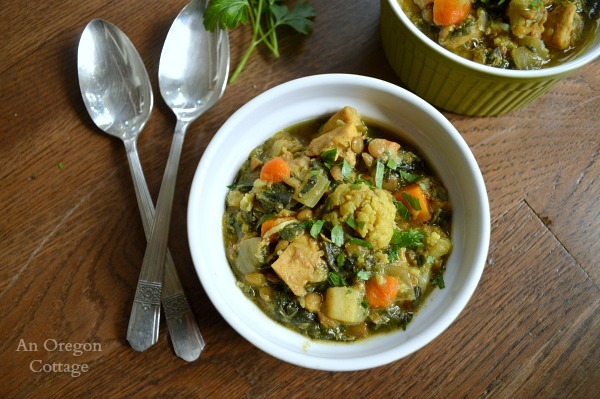 What are your favorite healthy soups, stews, or slow cooker meals? Be sure to check out all of AOC’s soups, stews and slow cooker recipes here in the recipe index. What a fabulous looking list! I love soups and stews during the winter and also love letting the slow cooker do the work for me. I just hope there’s enough cold weather left to make it through this yummy list! ? I’m sure there will be, Karen – at least here in the rainy NW warming meals are welcomed into June sometimes, ha!